You will have exclusive use of the sensory room but if we have holiday-makers staying at Ellie’s Haven the house and garden will be out of bounds. The sensory room and holiday retreat share the same entrance area (as does the Ellie’s Haven office). You will have the use of a wet room with a roll-in shower and WC adjoining the entrance area. Our sensory room is wheelchair accessible and a hoist for use with the audio-vibration water-bed. If you need to use the hoist please bring your own slings! 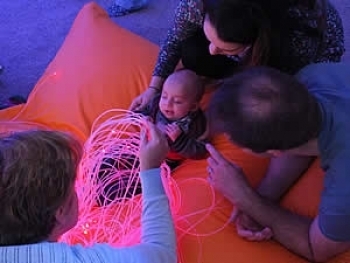 The Sensory Room is packed with equipment that can be used in all sorts of ways, from creating a very stimulating environment with lots of interactivity to the opposite, creating a calming ambience that induces relaxation. 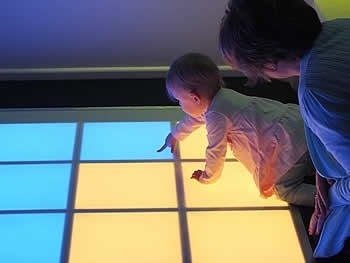 Click here to download a detailed plan of the sensory room as a PDF.